Members & friends of our Nauset Rotary Club spent the morning of November 4th picking up trash and debris along Nauset Beach. Thanks to member Melissa Hennessey for coordinating the project. Shark Swarms invade the Nauset Region! 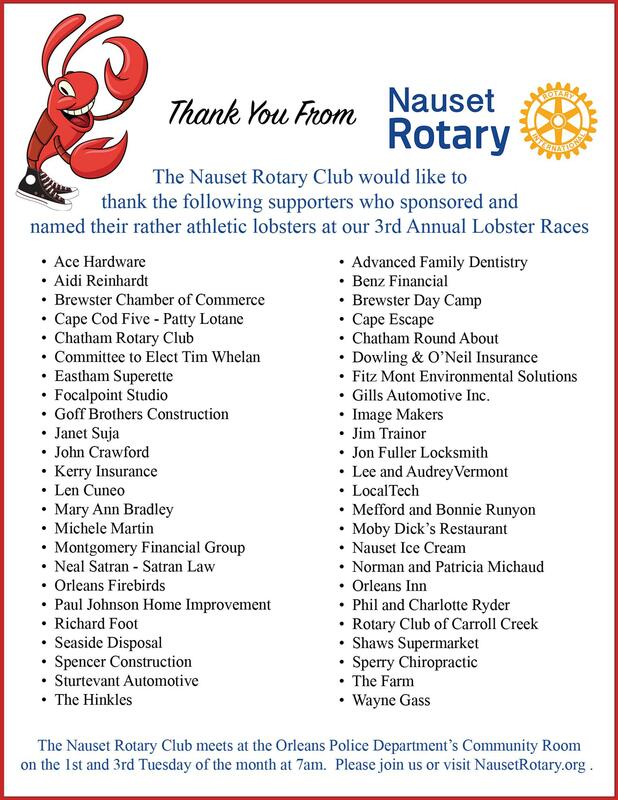 Sharks are swarming yards all over the Nauset Region and the members of the Nauset Rotary Club can rescue you from this scourge! The Board decided that the first Tuesday in November will be a club assembly. 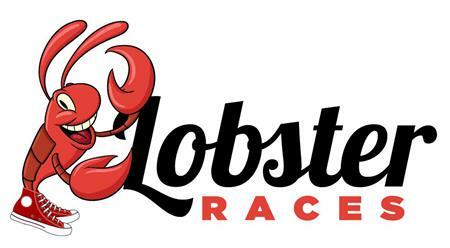 The raffle website is up and there is a link on the club website. People can purchase their tickets using a credit or debit card. Now have 36 tickets sold. Ask them for a donation, not buy a raffle ticket. Len spoke about membership and said he hoped everyone had a chance to read the handout they had last week. He said the next step is to I.D. potential members and make a list. He will start collecting names from Club members next week. Marcia introduced the program for the day. She said that the Galazzi’s have been investing in Cape Cod Tech volunteering since moving here in 1974. 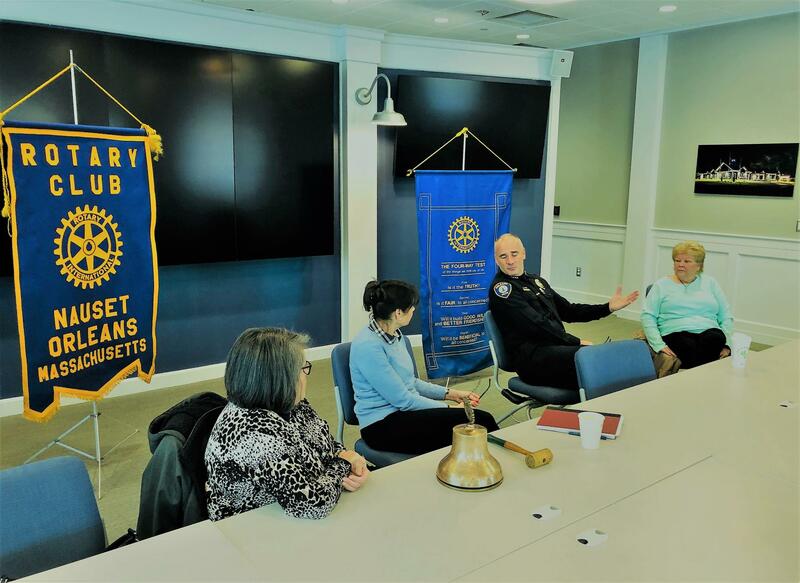 She added “It has been a pleasure to watch the school flourish.” Stephan Galazzi has been on the school committee and invited Superintendent Bob Sanborn, and Director of Technical Education Lou Colombo to speak to the Club. DG Kristine said that one of the first challenges she had is being short behind the podium! She came from Chicago but went to the Wheeler School in Providence where later she served on the board of directors with Marcia’s daughter…small world. Representative Whelan lives in Brewster with his wife Lisa and two daughters. He said his background is in policing, and fresh out of high school he started working in corrections. Most of his career was spent in uniform as MA State Police with the last 5 years spent in Yarmouth. He retired from the state police in 2013 in order to run for office. He said he’s now having conversations with people that he wouldn’t have been able to have as a state police officer. The Jones’ youngest child Alexander has severe autism and he is the inspiration to create Cape Cod Village. This will be a residential community for young adults with autism who require 24 hour assistance and care. Bob explained that this year more children will be diagnosed with autism – 1 in 68 has an autism spectrum disorder. His son is now 26 years old: when he was diagnosed it was 1 in 10,000. No one knows what has happened to see this incredible spike. The life time costs of care is in excess of two-million dollars. Liz said she decided to focus on the top ten people in her life and how they influenced her. First, her Mom and Dad. Liz was born in Philadelphia and called Betty Jean through the 6th grade when she dropped the Jean part. Then in college she dropped Betty to use her more formal name Elizabeth. She said her mom taught her to knit – which she loves to do. Her dad was a musician who played the trombone and had been with Tommy Dorsey. Then he became a printer and when she was in the 3rd grade they moved to CT. There she met Karen Nickerson and they are still friends today! Joe was stationed on Tinian Island as a surgical technician waiting to invade Japan when the bombing of Hiroshima occurred. He shared his memory of this today. Bob Tucker, classification photographer and Heidi Boas, classification nurse practitioner retired, shared a piece of their lives today. President Elect Bob "in the saddle" again! 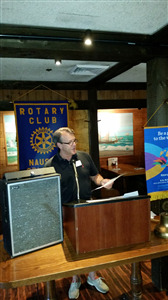 President Elect Bob (filling in for vacationing President Herb) rang the bell at 7 AM and another Rotary day was started! 2015/16 Rotary Year off to a Good Start! President Herb rang the bell promptly at 7:00 AM on Tuesday, July 7 to get the new Rotary Year off to a good start! Jennifer Smith was our guest speaker today to update the Club on the work of the Community Health Partnership in Honduras. 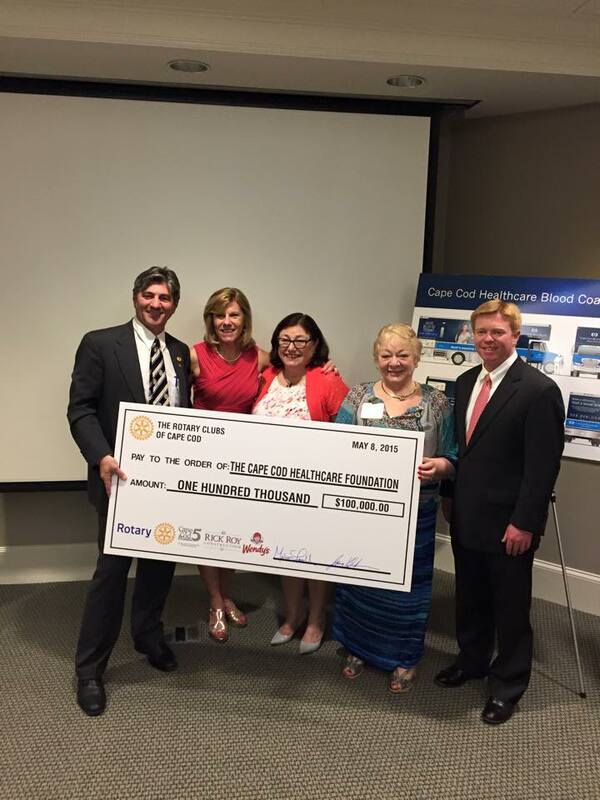 Thanks in part to the Rotary clubs of Cape Cod, collecting blood for local hospital patients will get easier. The clubs have raised $100,000 for the purchase of a bloodmobile for the blood center at Cape Cod Healthcare, the parent company of Cape Cod and Falmouth hospitals. The bloodmobile will allow the organization to collect blood across the Cape by holding drives at businesses, churches, schools and organizations that may not have the space to hold a drive. All of the blood collected will remain on the Cape, according to a statement by Jim Saben of the Yarmouth Rotary Club. Currently less than 40 percent of blood needed by Cape Cod and Falmouth hospitals is collected on the Cape. The rest must be purchases from off-Cape sources. The Nauset 8th grade English Language Arts (ELA) classes are looking for enthusiastic elders, seniors, sages and retirees, as well as people with some spare time who want to join our intergenerational book groups. This is an opportunity to independently read literature that our students are also reading and engage in lively intellectually stimulating dialogue about the books and how it relates to life. Adults and students alike will prepare notes for discussion and be ready to share their ideas and insights in small group discussions. Adult participation can vary according to time availability. A one-time opportunity to read a short story with the youth book group is available in October; as well as an additional extended opportunity for a book reading in February. If you enjoy reading and would like a chance to spend quality time with our wonderful teens, please contact Ann McConchie at mcconchiea@nausetschools.org.